As fun as it is to try new things while cooking, there’s also a lot of value in having Ye Olde Weeknight Standards. You may be the most energetic person in the world, but if you’re working a job, you probably aren’t cooking adventurously every night. On nights when you aren’t feeling so “up to it,” you can have Thai takeout, eat pasta, or order a pizza, but you’d probably feel better – about yourself or about what you just had for dinner – if you cooked something cheap and healthy. To wit (to wit! ), it’s especially great to have weeknight standards in the back of your brain that you can whip up with little shopping, no prep and almost no work. Unfortunately, I don’t have any such dishes to offer you here, so you’d best be served by clicking somewhere else. Or just order those drunken noodles. This is actually a really great weeknight dinner; it comes together in maybe 15 minutes and is pretty healthy, even though it contains both pasta and sausage (and hence is satisfying). 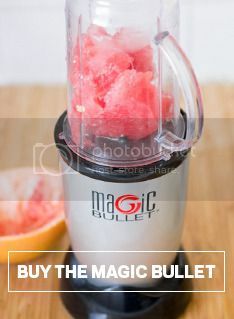 The Magic Bullet does a great job of bringing a burst of freshness to the dish, just don’t leave out that basil topping. Cook gnocchi in heavily salted water, 3 minutes or until beginning to float. In large pan, preferably with sloped sides, heat a bit of olive oil over medium-high heat. Add the sausage and red pepper flakes and cook, stirring once, until browned. Push the sausage to the side. Add the tomatoes and cook until tomatoes start to blister and brown. Stir in cooked gnocchi. In Magic Bullet, chop leaves of basil with a dash of olive oil, stopping to shake container to mix up the basil. When all basil is processed, add to pan and stir everything together and add salt and pepper to taste. These grilled chicken strips on sticks paired with a tangy peanut sauce make an easy, fun appetizer. The marinade takes only a few minutes to prepare by adding all of the ingredients to a Magic Bullet cup and blending them together to make a nice, even marinade for the chicken strips. By the time you are finished with the peanut sauce and your indoor grill is preheated, the chicken strips are nice and flavorful and ready to be grilled! You can heat the peanut sauce in a saucepan if you prefer it hot, but it also tastes good at room temperature and the chicken strips will already be very hot off the grill! Add all marinade ingredients to a Magic Bullet cup and blend until evenly mixed. Pour over the chicken strips in a shallow bowl, and refrigerate for 30 minutes. Combine the peanut sauce ingredients in a small bowl and set aside. In the meantime, prepare the strips by piercing them with wooden skewers. Grill the chicken strips about 5 minutes (or 2-3 minutes on each side) and serve hot with the peanut sauce. It’s brunch season, people. Which means Eggs Benedict. Which means Hollandaise Sauce. Possibly my favorite part of Eggs Benedict. Here’s how to make it in five minutes before everyone else wakes up and pretend like you slaved over it for hours. It’ll be our little secret. 1. After separating the yolks from the whites, add lemon juice. 2. Then the melted butter. 4. Then give it a good blend until everything has been nicely incorporated. 5. Then toast your English muffins, heat up your ham, poach those eggs, and pour on the Hollandaise sauce! If nothing else goes right the rest of the day, at least you’ll have had this deliciousness for breakfast.